With the support and blessing of Kirsty MacColl’s family and management, a proposal was put to Westminster Council to place a Bench in Kirsty’s memory in Soho Square, central London. 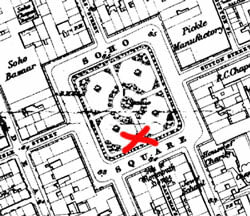 Soho Square is a garden in the middle of one of London’s busiest areas. It has a special place in the hearts of Kirsty’s fans as the setting for a song on the Titanic Days album: it’s where “the pigeons shiver in the naked trees” and there’s “an empty bench in Soho Square”. Kirsty once said that had she appreciated the special fondness for this song amongst her fans, she would have included it on the Galore compilation. 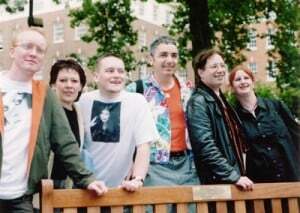 The Bench was unveiled in a public ceremony in Soho Square, London on Sunday 12th August 2001 at 11am. Speeches at the unveiling came from organiser Chris Winwood and Kirsty’s mother Jean, who handed over the cheque for the Music for Cuba Fund to Steve Wilkinson of the Cuban Solidarity Campaign and the Cuban Ambassador to Britain. Kirsty songs were played over a PA system to add the necessary ambience. As the song Soho Square finished, two pigeons flew over the bench. A decent turnout of 150 consisting of fans, family & friends plus the occasional passing tourist ignored the rain and celebrated Kirsty’s memory in the Square before heading to the excellent, welcoming and acoustically rocking Pillars of Hercules after a brief attempt to enjoy the day in another establishment ended in a mass walkout of Kirsty fans and relatives. Once safely in a decent pub, the Kirsty songbook (and the Bragg one, thanks to Terry!) was comprehensively sampled to varying degrees of accuracy in a touching display of community singing, fed by the guitar lines of star contributors John “Aloha” Meranda, Craig “Buskin'” Ferrier and Terry “where’s Wiggy?” Hurley. Old friendships were renewed and new ones started. Ian Akin, Deborah Albericci, Ben & Michelle, Steve Burford, Matthew Cain, Dawn Coates, Wayne Connolly, Jess Cully, Eunice Dovey, Tim Emanuel, Craig Buskin' Ferrier, Jonathan Flowers, Andrew Glover, Terry & Sue Hurley, David Insull, Patrick Jervis, Alex Kemp, Duncan Lewis, Joanne Lewis, Guy & Victoria Loveridge, Ross McMichael, Phil McNeil, John Meranda, Alan Morton, Jonathan Oakley, Alan Officer, Derek Parker, Eric Rose, Mark & Sue Sanders, Graham Scaife, Mr C Smith, Justin Smith, Jennie Sykes, Szelkie, David Tatlow, Garry Thirlaway, David Vance, Chris Voisey, Dolly Whilems and Derek Adams, Philip and Rose Whiteley, Colin Williams, Chris Winwood, John Wood, "A Friend". Note: other donors may have requested anonymity. Many thanks to Eddi Reader and Sincere Management for their help with promotion. Many thanks on behalf of Kirsty's family and everyone involved in making the bench happen to all who have contributed - by sending donations, attending the unveiling or both. Every year on the Sunday closest to 10th October (Kirsty's birthday), a merry band of Kirsty's fans, friends and relatives congergate at the bench at noon, before adjourning to a nearby hostelry to remember Kirsty and her songs in a most convivial atmosphere, all are welcome. Come and visit … often! It was a pilgrimage for my family and I to visit Kirsty’s memorial bench today in Soho Square. We searched a bit and found it, then once an unknowing occupant left we solemnly occupied the spot and took photos and shared the moment in her honor. We played Fairy Tale of New York and my daughter read Kirsty’s poetic lyric from her darkly hopeful song Soho Square to us as we celebrated her memory. We are all better for her artistry taken too soon. This world craves more like her. Such a lovely tribute! Always was a fan and often wonder what she would have gone on to sing and do? So sad but the good so often do seem to die young! She left a great catalogue of work! She was just great! I still listen to her music. Hope to visit her bench in Soho Square this summer. I just discovered her wonderful voice and cannot get enough of her I will be in London in a couple of years and will definitely visit the bench.